One of the first examples of the type of device that would later become known as a PDA, the AgendA was equipped with 32K RAM, a 4-line LCD display, a series of built-in applications (wordprocessor, database, calculator, to-do list, organiser, and alarm), and programming language called ABC (a Pascal/BASIC hybrid). 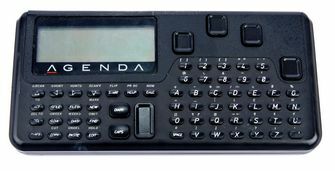 In addition to the conventional keyboard, the 5 keys on the top right of the device allow an alternative, one-handed input mechanism termed chording (on the basis that it allows entry of different characters by pressing key combinations like chords on a piano); a method dating back to the original Microwriter device from the early 80s. 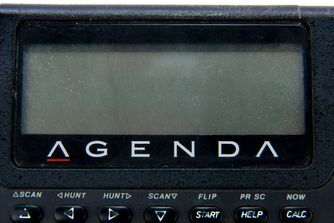 The AgendA was the recipient of the 1990 British Design Award. Click to view any of the photos. All comments are moderated before appearing on the site - there will be a delay with comment approval.